In the first part (available here), I looked at four of the leading ladies - Serena Williams, Maria Sharapova, Victoria Azarenka and Li Na. In this second part, we look at four of the ladies that could potential wrestle the title away from the leading four. Another player for whom 2012 has been a breakout year, the Pole has climbed to a career high of number three in the world, collecting titles in Dubai and Miami in the process. However, were it not for the spectre of Victoria Azarenka hanging over her, she would undoubtedly have more titles. 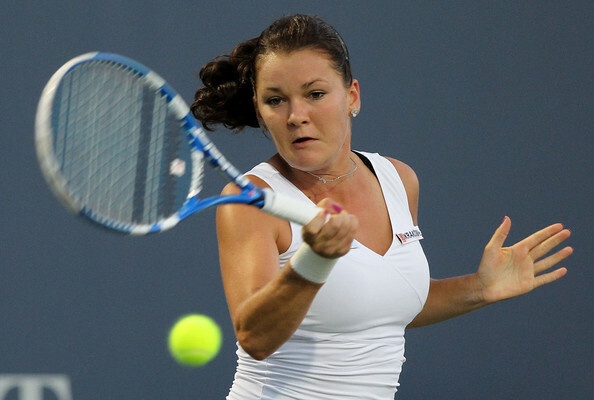 In the past, Radwanska has struggled against the big power-hitters. However, she has subtlety adapted her game in the latter part of last year and the early part of this. The change has seen a rapid improvement, although the one player that has consistently caused her problems has been Victoria Azarenka. Can Radwanska advance to her first Grand Slam final at the site of her junior triumph? She will have been pleased to find herself in the ‘weaker’ half of the draw, albeit the same side as her nemesis, Victoria Azarenka. However, a dangerous second round encounter with Venus Williams awaits, which should provide an early test of her credentials. Should she progress, she faces another challenger against the former champion, Svetlana Kuznetsova, who admittedly is not the force that she once was, but still remains a talented player. Errani or Ivanovic await in the fourth round, before a quarter-final match against Angelique Kerber to set up a seventh opportunity against Azarenka. While she is arguably one of the form players, if Radwanska stands any chance of winning this tournament, she will have to find some way of beating Azarenka. However, her style simply does not match up well against the power of the Belorussian, and it seems unlikely that she will change this on her least favoured surface. After winning her maiden Grand Slam title at Wimbledon, securing the WTA Year End Championship and leading the Czech Republic to Fed Cup glory in 2011, this year was meant to be the year that Petra Kvitova cemented her status as the top player in the world. It seemed simply a matter of time before she rose to number one, but the emergence of Azarenka scuppered those plans. Without a title in 2012, she finds herself as the number four seed and looking to restore her confidence on a surface where she often has a few issues. However, she remains optimistic that she can cause a stir at Roland Garros. “Everyone was surprised that I won Madrid in 2011 and I think I learned that I can play on the clay too.” Indeed, as a small girl, she began her career on the clay courts of the Czech Republic. When she is on form, there is nothing that can stop her. Having returned from a difficult American swing, where she often struggles due to her asthma, she swept aside all-comers on the indoor hard courts of Asia and Europe late last year. Six titles on four different surfaces bear testament to her constant threat. She will also be pleased with her draw in Paris this year. The Australian wildcard, Ashleigh Barty, should provide little resistance, while she is seeded to play Monica Niculescu in the third round – a player whose style gives her little opportunity against the power striking of the Czech. A match against either Jankovic or the 2010 Roland Garros champion, Francesca Schiavone, awaits in the fourth round, but both those players appear to be well past their best. Li Na should be her first real test, before the major challenge of derail either Serena or Sharapova to reach a first final. It is impossible to discount Petra Kvitova from any tournament, although it would appear that there are more suitable challenges to come in the near future on the grass of Wimbledon. Having said that though, she won two clay court titles in 2011, and if she is on form, she could ride the wave of success deep into this tournament. Roland Garros holds bittersweet memories for Samantha Stosur. While it was the site of her first Grand Slam final, the very same match was the greatest disappointment of her career, as she lost against Francesca Schiavone. During the Australian Open, she struggled under the expectations of her home crowd, crashing out at the first hurdle against Sorana Cirstea. Since moving to the clay, she has reached one semi-final in Charleston and a pair of quarter-finals in Stuttgart and Madrid, but will be hoping that she can go further at Roland Garros. She will be relatively happy with her draw. Elena Baltacha should provide little trouble, while the first test could be a third round encounter with the Russian, Nadia Petrova, who took Serena to three sets in Rome last week. Sabine Lisicki could be the fourth round opponent, although she does struggle to bring her game on clay courts, while the biggest test will be against world number one, Victoria Azarenka in the quarter-finals. If she can beat Azarenka, she could easily go the whole way. Stosur is a definitely contender for this title. A beaten finalist two years ago, and a semi-final in 2009, she knows what it takes to go deep into the tournament and it will take a good player in good form to stop her. It was four years ago when Ana Ivanovic won the title at Roland Garros as she marched to the number one ranking in the world. At the time, it looked as though the next tennis superstar had arrived. The last twelve months have seen somewhat of a resurgence for Ivanovic. Although she failed to win any titles in the regular season, she did win the second-tier end of season championship in Bali for a second consecutive year, and her ranking returned into the top twenty. Four years ago, Ivanovic was the French Open champion. Can she relive those glory days in 2012? She has been beaten by Azarenka and Sharapova in her last two tournaments on clay, but the matches have been close. While she is still waiting for that big win to restore her confidence, she is managing to put away the lower ranked players, and she has proved in the past that she is capable of beating the top names. She will like the draw that she has received as well. She faces Spanish qualifier, Lara Arruabarrena-Vecino in the first round, but the first test is likely to come in the third round as she faces Sara Errani. Errani has been in good form this season, but has struggled against the better players, of whom Ivanovic could be classed as one. She faces a tough match against Radwanska in the fourth round before a quarter-final meeting with either Marion Bartoli or Angelique Kerber to reach the final four. While Ivanovic is by no means a favourite for this tournament, she knows what it takes to win in Roland Garros, and if she is able to get into the zone, her powerful ground strokes are capable of blasting through any opponent.